Today we have a guest post Dr. Nicholas G. Heavens. He is a Research Assistant Professor of Planetary Science at Hampton University in Hampton, Virginia. He studies the weather of present day Mars, the climate of late Paleozoic Earth, and the atmospheric evolution of Earth-like planets outside the Solar System. He is a member of the Mars Climate Sounder science team. Chances are, at some point, you have found yourself by a still body of water on a rainy day. Entranced by the smooth surface of this lake or pond, you began to feel the rain fall on your head and shoulders. And as the rain fell on the water, you noticed circular ripples radiating out from each raindrop and moving toward the shore. Those ripples are a particularly beautiful and elegant example of a type of wave known as a gravity wave (or sometimes buoyancy wave). The raindrop’s impact depresses the surface of the water, upsetting the balance between the force of gravity and the pressure exerted by the water. Water then moves into the hole to restore this balance, creating a further imbalance that spreads the energy of the impact (but not the water itself) outward as circular rings. Gravity waves in water are a familiar sight in our everyday lives, but gravity waves are common in atmospheres as well, including Mars’s. On average, gravity and air pressure in Mars’s atmosphere are in balance, meaning that less dense air is higher in the atmosphere than more dense air. However, in some situations, denser air can be forced over less dense air, resulting in gravity waves that can propagate to higher altitudes and grow in amplitude as they do so. Some of those waves can be quite inconvenient, since they make up much of aircraft turbulence. When you look at Planet Four images, you stare at high-resolution, mostly cloudless images of Mars near its poles. What I want to show you today is what might be happening in the atmosphere above, as seen in cloudy, low-resolution images of Mars. It is common to see visible indications of gravity waves in the winter hemisphere around 45 degrees south, but gravity waves are likely active at other times and places. Circular gravity waves near 45 degrees south late in Mars’s northern summer. This Mars Orbiter Camera Daily Global Map is freely available to download at http://marsclimatecenter.com/data/mocbrowse/. 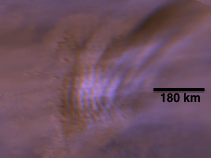 Nearly linear gravity waves near 45 degrees north late in Mars’s northern autumn. This Mars Orbiter Camera Daily Global Map is freely available to download at http://marsclimatecenter.com/data/mocbrowse/. In the first image, do you see circular, whitish ripples near the center of the image? Something analogous to raindrops dropping in a pond has happened there. In the parts of the waves that correspond to rising air, water vapor is cooled and condenses into ice to clouds that trace out the waves. In the second image, the wave fronts are not strongly curved and appear to be radiating in one direction, probably indicating that a strong wind is affecting the waves. In each case, the wavelength of the waves can be easily measured, around 40 km in the first case and around 20 km in the second case. The source of the first set of waves is unclear (at least to me). The source of the second set of waves is probably the interaction of dense cold air from the pole moving over less dense warmer air at lower latitudes. In some images, the source of the waves can be traced to wind dropping down into a crater. Studying gravity waves can tell us much about how Mars’s atmosphere works from bottom to top. Future Martian glider pilots also might appreciate knowing when they occur and the conditions they will create. But I will admit that my interest in Mars’s atmospheric gravity waves continues to be fed by the disturbing beauty they bring to Mars’s thin atmosphere.